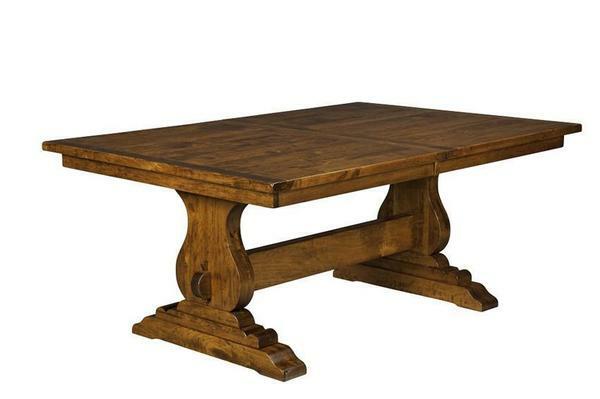 Our Austin Plank Top Trestle Dining Table pairs perfectly with Amish Austin Dining Chairs. Chair backs and table base feature expert carving, almost sculptural! Available in 6 different sizes and the option to add extensions, it's easy to find the size that's right for your family -- and extra guests! Shown in brown maple with Nutmeg stain, make it uniquely your own with your favorite wood species and stain. If you need assistance creating the dining room set of your dreams, please give us a ring! We are ready to answer your questions on any of our Austin pieces or a custom Amish furniture piece you have been dreaming about.